Marsa Abu Dabbab is a sheltered bay North of Marsa Alam well known for its green turtles and the elusive dugong. I took a group of students from my school snorkelling there on our last day during a school trip. The dugong was nowhere to be seen, but we swam with a sailfish and 6 green turtles. I went free diving to about 10 metres to take this picture. 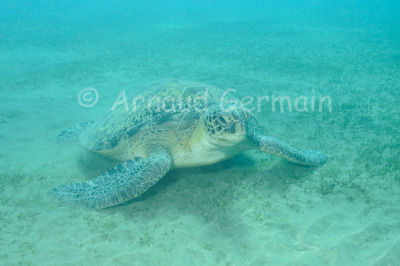 Green turtles eat sea grass, hence their presence in the bay. Marsa Abu Dabbab, about 10 metres down, snorkelling, Marsa Alam, Egypt.